Another season, another presidents’ trophy, another playoff series loss. The Canucks finished the 82 game schedule with 51 wins, 22 losses and 9 o/t losses for a total of 111 points, 2 points ahead of the New York Rangers and St Louis, as well as 21 points ahead of the second placed North-West division team, the Calgary Flames. A succesful regular season campaign, pitting the Canucks against the 8th placed LA Kings in the first round of the playoffs. That’s where the story unfortunately ends for the Canucks, who were amongst the betting favourites to win the Stanley Cup, one year after the dramatic game 7 final series’ loss to the Boston Bruins. Vancouver lost the first two play-off games at Rogers Arena by a 4-2 scoreline, followed by a 1-0 loss at the Staples Center. The Canucks redeemed themselves in game 4, following the return of Daniel Sedin, beating the Kings 3-1 in a hard-fought victory but it all came unstuck when the Canucks gave up an early lead to lose game 5 (and the playoff series) 2-1 in overtime. Despite the playoff loss, the Vancouver Canucks provided fans with an eventful season featuring many ups and downs. Below are a few videos defining the year that was for the boys in blue. Barry Wilkins, Rick Rypien and Pavol Demitra Tribute Videos. Nicklas Jensen drafted 29th overall by the Canucks in the 2011 NHL Entry Draft. The 2011/12 Season Opener Video. Canucks acquiring power forward David Booth, sending M.Samuelsson and M.Sturm to the Panthers. Daniel Sedin scores hat-trick against the Avalanche on 6th of December 2011. The game of the season: Vancouver Canucks vs Boston Bruins on January 7th, 2012. Kevin Bieksa saving a sure goal then scoring. February deadline day trade- Cody Hodgson and Alex Sulzer for Zack Kassian and Marc-Andre Gragnani. The Duncan Keith elbow on Daniel Sedin on March 21st, forcing him to miss the first 3 playoff games. A second consecutive President’s Trophy win. The 2012 Playoffs intro video. 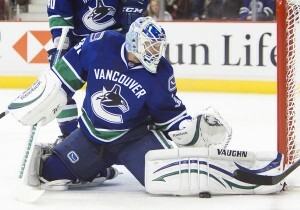 The goal that ended the Canucks hopes for 2011/12. The amazing weight loss of anthem singer Mark Donnelly. The return of the Green Men. The Alain Vigneault laughing fit (AKA the Fiddler incident). With an off-season of changes expected this summer, the only phrase relevant to Canucks fans after another bitter play-off series defeat is once again, “there is always next year”. Thanks for another entertaining season of hockey Vancouver Canucks.